NEW YORK—Over the weekend, Dec. 14–15, the Brooklyn Museum carved out a large space on its third floor for a festive holiday market. The first annual American Fine Craft Show Brooklyn welcomed 90 jury-selected artists working in all mediums, including wearable ones like jewelry and fiber art. Artists came from throughout the country, with a heavy representation from Massachusetts and New England. New Yorkers may be familiar with Richard Rothbard’s “Boxology” line of wooden puzzle boxes, which can be found at An American Craftsman in Manhattan. We also met two instructors from La Mano Pottery in Chelsea. Josh Simpson from Massachusetts has spent 40 years in glassblowing. He melts silver and other metal compounds with the glass to produce iridescent effects in his vases. Simpson also produces a series of “inhabited planets” formed by layers and layers of glass. 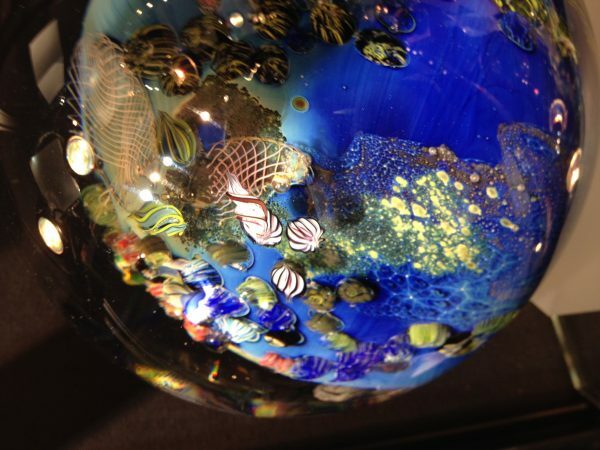 The Corning Museum of Glass has a 100-pound paperweight from Simpson’s studio. Artist Jon Greene and his wife Suzanne run Cape Kaleidoscopes in Cape Cod, Mass. The store carries handcrafted kaleidoscopes from several artists, but Greene’s own creations were a customer favorite at the fair. Two wheels screwed onto the end of a brass or chrome body are set with semi-precious stones and glass. They turn independently of each other, making for an endlessly mesmerizing view. 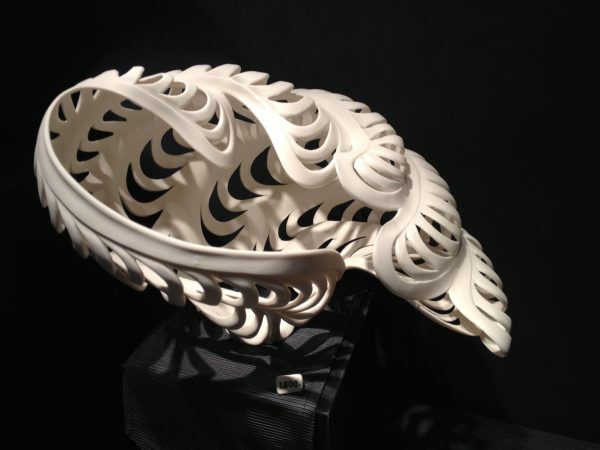 Ceramic artist Jennifer McCurdy from Vineyard Haven, Mass. has been making wheel-thrown porcelain for over 25 years. 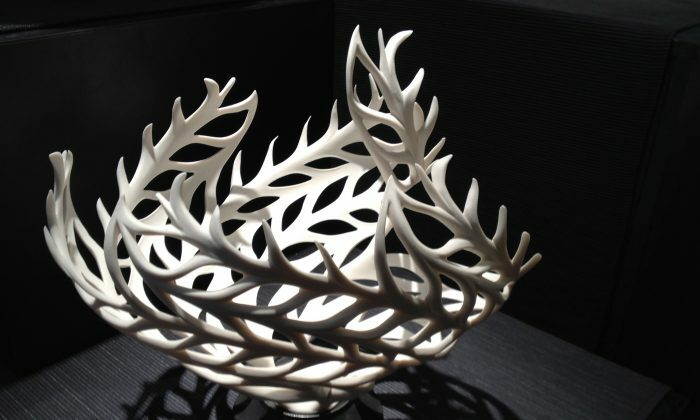 By taking advantage of two “plastic stages” at the beginning and end of the process, McCurdy turns a regularly shaped vessel into a free-flowing, fantastical shape using an X-Acto knife. Nonna Hall and Jessie Lazar are both instructors at New York’s La Mano Pottery. 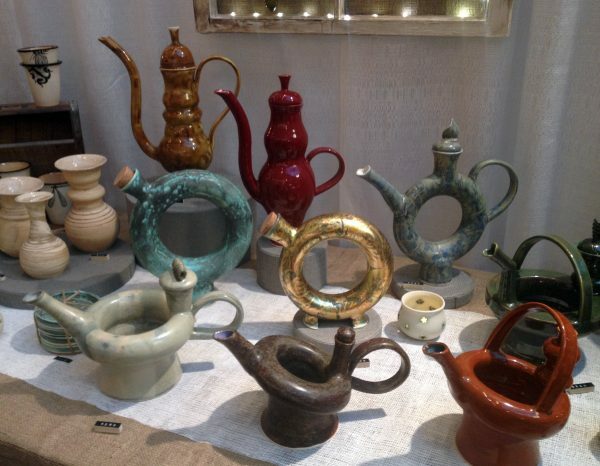 Turkmenistan-born Hall takes inspiration from Mediterranean and Russian tea culture for her pottery designs. The donut-shaped flasks were traditionally used to carry cold drinks. She has modified the design for hot drinks like tea. Lazar creates metal jewelry and ceramics that feature whimsical line drawings. Massachusetts-based sculptor Laura Baring-Gould, who does ephemeral large-scale installations in museums and galleries, considers her bronze crafts her permanent work. 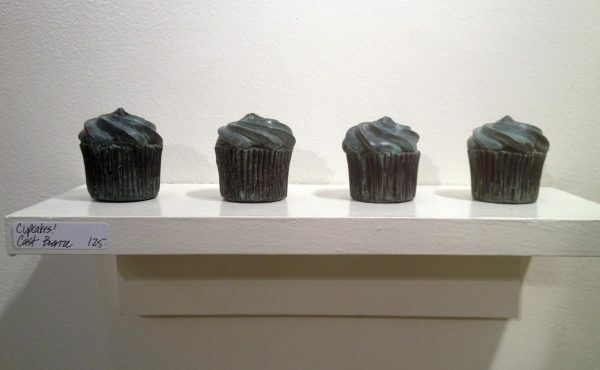 She takes perishable items like pears, seeds, nuts, and cupcakes, coats them in clay, and immortalizes them in non-oxidizing bronze.